My Friend Has a Blog ~ The Bucky Channel - The World of Sports from Wisconsin's Perspective. This is my friend, Pat. Pat is what you call "a pretty good athlete". He starred in various sports at Neenah high school, and then was a football walk on at the University of Minnesota. 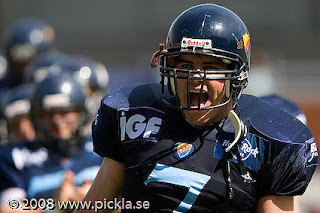 The picture of above is of him doing some of sort celebratory scream while playing professional football in Sweden. Pat and I are unlikely friends, if for no other reason than our attendance at rival high schools. But one thing I have found out in life is that the bigger the rivals you are with someone in high school, and the better the drinking buddies you are in college and beyond. Something about this man I did not know until recently - he's also what you call "a pretty good writer". And he started up a blog that I want to make you aware of, not just because I like drinking with him, but because it's a good read. The site is entitled Walk on Boy, referencing his experience at Minnesota as well as a song he likes by a band I don't know. Basically it's his space to write about whatever comes to his mind, much of that being football related. Case in point: This ridiculously well-detailed post about Matt Turk's decision to run for the first down after a botched punt attempt against the Packers last weekend. If you like football, and you like reading, then I recommend you become friends with Pat too.